Selenium tutorial for beginner is basic requirement of any selenium learner to learn selenium perfectly if it's free and complete. Selenium is very strong and open-source web application automation testing tool so selenium testing tool is booming now a days in software testing industry. Selenium has different projects like selenium IDE, selenium RC, selenium Webdriver, Appium and selenium Grid. Please note here, I am saying them different projects of selenium not a versions because each selenium project has it's own features and developed for different purpose. I have created tutorial series for different selenium projects with examples to support online selenium learner community. My selenium tutorial for beginners with examples will helps you to learn selenium testing very fast. All bellow given selenium project's tutorials will take you from basic to advanced level step by step and you will be master at the end of series. Trust Me !! Selenium RC is officially deprecated now so i have not created tutorial series for RC. Just start with selenium IDE tutorial series and end on selenium grid tutorial series. Bellow is selenium java tutorial series of different selenium projects. Selenium IDE is first project of selenium. It is basic record and playback add-on of firefox browser. 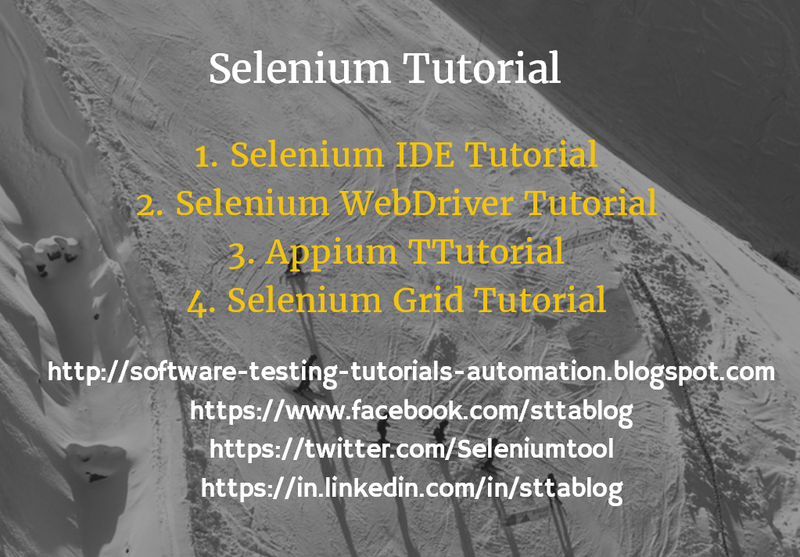 You can use selenium IDE if your application is not more complex to test. My Selenium IDE tutorial series will helps you to learn selenium IDE. Selenium Webdriver is latest project of selenium which is interface and designed to automate web applications. It is designed to overcome limitations of selenium RC(which is deprecated now.) so it is successor of selenium RC. I have created online Selenium Tutorial for beginner tips expert level selenium learners. Also i have created series of selenium interview questions with 110+ interview questions. It will helps you to face selenium testing tool interview. Appium is mobile native, web and hybrid application test automation testing framework. You can automate ios and android apps using appium. Appium Tutorial series is created to describe how appium works with examples. 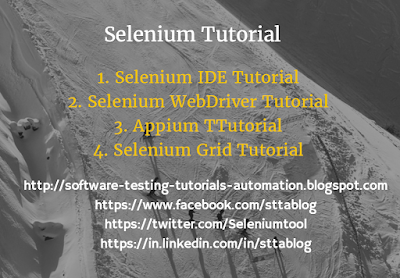 Selenium grid helps you to run your selenium automation tests in parallel on different machines and browsers to speedup your test execution. So you can run your tests on different machines which are running different browsers on different operating systems. Selenium Grid Tutorial series which is created to show you how actually grid can helps you to speed-up your test execution process. All above selenium tutorial series are created with practical examples and detailed description on each topic. Start selenium learning today to put your step in selenium automation testing industry and also share your new ideas with others. Also you can subscribe for selenium video tutorial if you can pay some bucks for learning. As per my view, investment in education/learning is best investment. Your Website is very helpful. Thanks for the Efforts. Its really very helpful. Thanks for sharing such a useful info. Its an amazing place to learn specially selenium. The way you approach to the problem is very nice. I feel this is best site for Selenium. Every thing explained in detail.